We bought a 24 oz bag of lobster claw meat just so we could make lobster pot pie again, the best pot pie in the world. The recipe calls for half the bag so we had another 12 ounces of lobster meat sitting in the fridge and there is no way I was going to let that spoil. 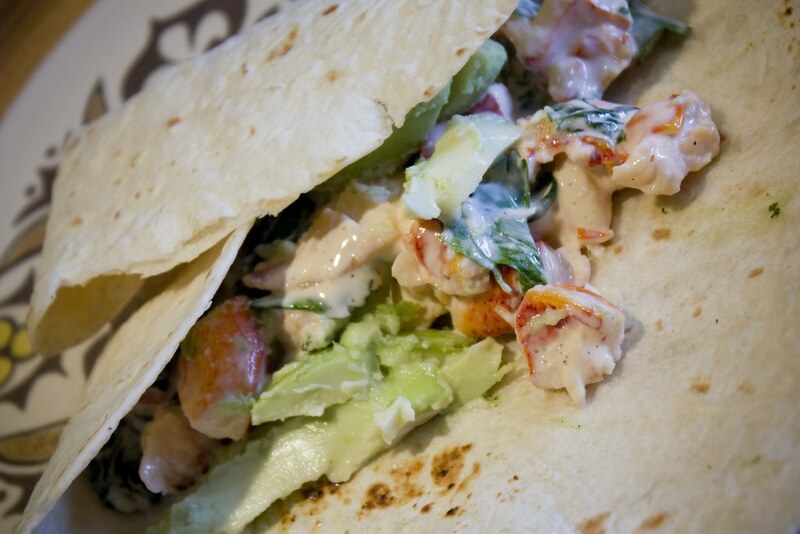 Together Thomas and I concocted these lobster lunch wraps and they're definitely a keeper. So I'm making them again tomorrow. In a large skillet warm a good glug of olive oil, add the lobster and toss until warm and heated through. Remove lobster from pan and put into a small mixing bowl. Set aside. Next wilt the spinach by adding another tsp of olive oil to your warm skillet. Toss spinach in pan until wilted. In small mixing bowl with lobster add the spinach, mayonnaise, and parsley. Mix gently to combine. Add salt and fresh ground pepper to taste. Spoon half of lobster mixture on to each tortilla. Peel and slice the avocado and add it to the tortilla. Wrap tortilla and serve. Enjoy! Yum! Sounds (and looks) absolutely delicious!